After putting my Sunflower design on hold for a month while I designed and stitched my new collection of Christmas kits I have now been able to get back into the stitching and have completed the mini cushion and made up a batch of kits. I usually add new kits to the website on Sundays but this week I managed one day earlier. 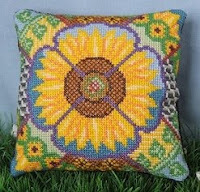 Sunflower Supreme is a slightly different design to my other mini cushions as it features one huge flower taking up the central area rather than 4 separate segments. I tried to incorporate different images of sunflowers, including the patterns made by the seeds in the flower head, and the stripy rows of yellow and cream were to represent fields of sunflowers from a distance. This design allowed me to use very bright colours in the yellows, greens and blues which I really enjoyed stitching with. My next design has a more subtle palette with an Edwardian feel to it, and petite bouquet motifs. I couldn't resist taking a photo of all 4 stitched sets from my Christmas Collection and I think this year these hanging decorations will be adorning my Christmas tree.